Elsewhere on this site, I have argued that 'Wildlife Gardening' should not be thought of as a method of gardening which results in gardens of a particular type, but rather as a group of techniques which can be used to benefit wildlife and people in gardens of all kinds (e.g. Principles of designing gardens for wildlife). The project described in this feature illustrates this concept perfectly. One of the best ways of making a garden more amenable to wildlife is to increase the number of 'nooks and crannies' One of the best ways of making a garden more amenable to wildlife is to increase the number of 'nooks and crannies' which can provide shelter, breeding and hibernation spaces for all sorts of animals, particularly the invertebrates on which so many of the 'higher' animals, like birds and mammals, depend. A wildlife gardener is always looking for opportunities to do this, no matter what project he or she is engaged in A wildlife gardener is always looking for opportunities to do this, no matter what project he or she is engaged in. 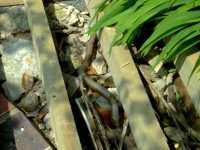 When I recently made a small deck adjacent to my pond, I was mindful that the space underneath it could be used to benefit invertebrates and other animals. 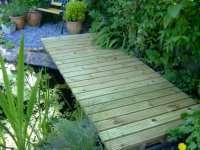 I was prompted by an episode of the BBC's Ground Force programme in which they packed the space under a high deck with all sorts of materials for the benefit of the wildlife. 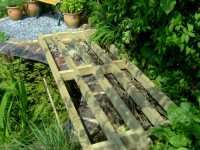 Although that was a high deck with plenty of space, the same techniques can be applied on a small scale to any structure with a space underneath, e.g. a low deck or a shed. In the interests of preventing premature rotting, you should be careful not to allow much contact between the material you place under the deck/shed and the structure itself. It's also a good idea to leave some large spaces which aren't packed with material. This will allow larger animals, like hedgehogs, to make use of the space too. 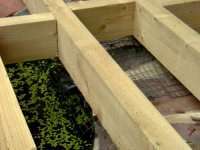 These pictures illustrate how the space under a deck which partly spans a pond was used to enhance the habitat for wild animals. Copyright Richard Burkmar 2003. Permission is hereby granted for anyone to use this article for non-commercial purposes which are of benefit to the natural environment as long the original author is credited. School pupils, students, teachers and educators are invited to use the article freely. Use for commercial purposes is prohibited unless permission is obtained from the copyright holder.